All new beds, sofas, floors, AC, lighting, linens, kitchen utensils, bathrooms, new in 2018. 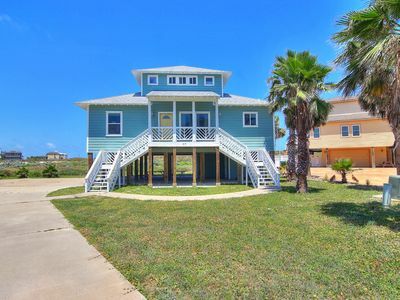 Bring the whole family to our beach house in the secluded Mustang Royale community in Port Aransas! 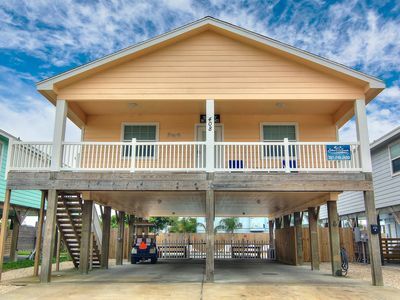 There’s plenty of space for everyone, including 3 bedrooms, 3 bathrooms and 3 separate deck areas. The 3rd floor deck is accessed from the living area and provides sweeping ocean views. Another deck at the back of the house has a great vantage point for sunset. 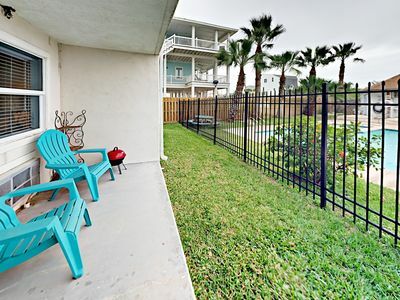 The 3rd deck off the 2nd floor puts you right in the path of lovely sea breezes. Boardwalk access makes it easy for the family to stroll to the beach together. The Boardwalk is now Golf cart Accessible! 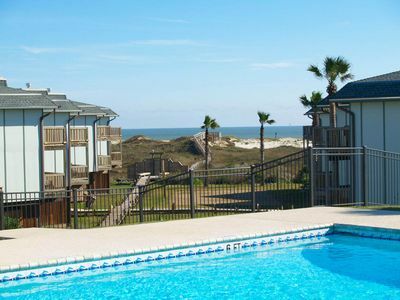 If you want to venture a bit further, the shops and restaurants of downtown Port Aransas are just a 3-minute drive away! 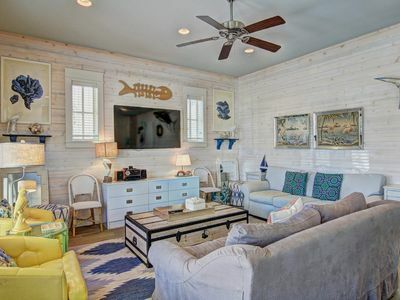 The open-plan living area is the starting point for your beach vacation. 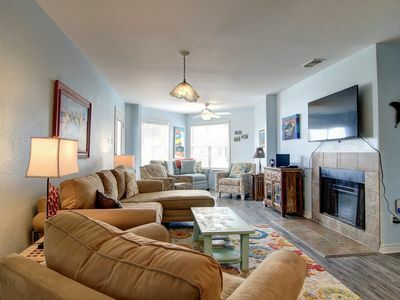 With ocean views, beach-themed décor, a flat-screen TV, and dining space for 8, it’s the perfect place to gather. 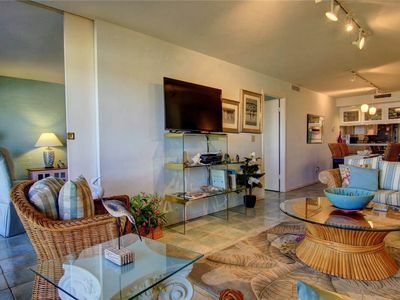 But the highlight of the living space is the extra-wide deck accessible via sliding glass doors in the living area. 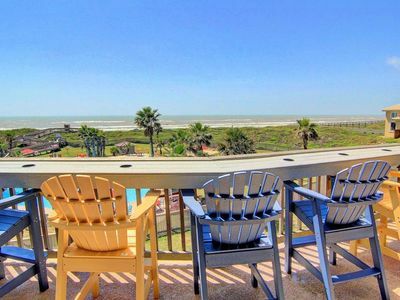 You’ll love the shimmering ocean views and sea breezes! 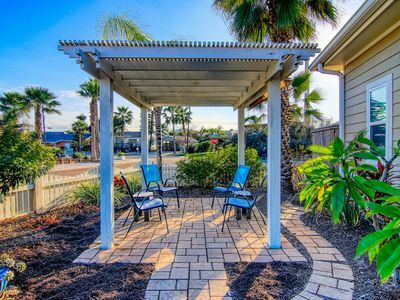 Take your ice-cold Arnold Palmer out to the porch swing for a luxury vacation experience. 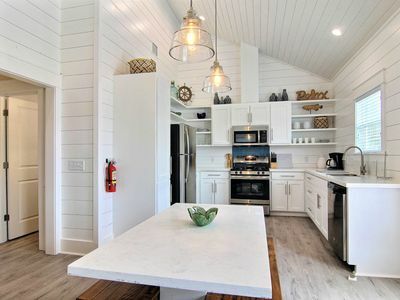 The living area opens directly onto the fully equipped kitchen, complete with granite counter tops, a breakfast bar with seating for 5, and a convenient laundry chute. 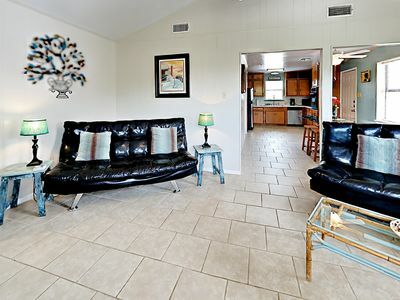 Speaking of laundry: we also provide a large 2nd floor laundry room with a washer and dryer. 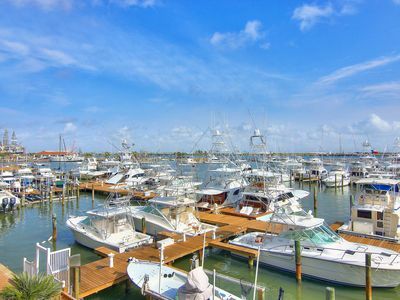 The ocean-view upper deck is also accessible from the luxurious master bedroom, furnished with a king-size bed and flat-screen TV. The master bath, also on the 3rd floor, has a walk-in shower, granite counters, and a walk-in closet. We also have a king-sized guest bedroom and a bunk room, which sleeps 6 and has its own TV. 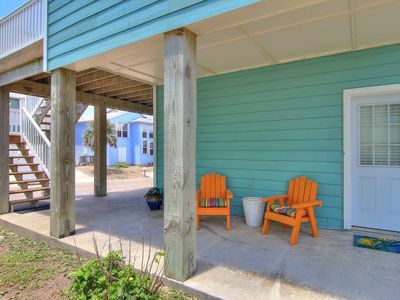 Both of these bedrooms have access to the lower, sea-breeze deck! There are 2 convenient bathrooms on the lower floor. 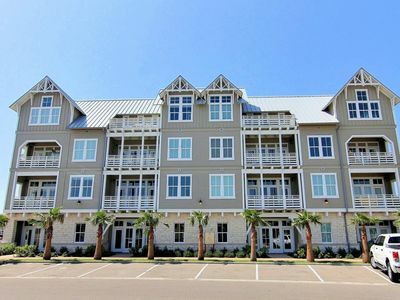 The beach is only a short walk away via community boardwalk access. All you need is towels, sunscreen, and flip-flops! When you get back, wash away the sand under our refreshing outdoor shower. Then, grab a cold drink (or re-stock your tackle box) from the "Bait&Beer" fridge in the garage. 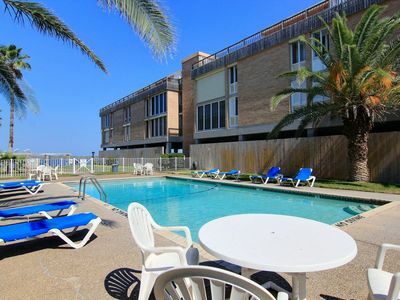 When you tire of the ocean, your stay includes access to the community pool with its own covered lounge area. Besides being moments from the beach, our beach house is right down the street from the Palmilla Beach Golf Club. Get in a round of golf before or after you hit the ocean. 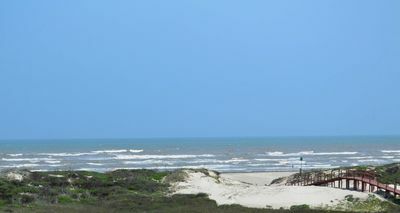 You’re also only an 8-minute drive from all the attractions of Port Aransas. Rent a bicycle and discover the local wildlife at the Port Aransas Nature Preserve! Or bring your appetite for seafood: the oyster po’boy at Irie’s Island Food, a 10-minute drive away, is the best on the island. Traveling with kids? Give them a serious treat by taking them to the newly opened Schlitterbahn Waterpark, which is 17 minutes away by car. 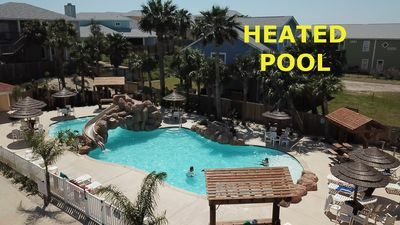 1 bedroom 1 bath condo with channelviews and community pool! 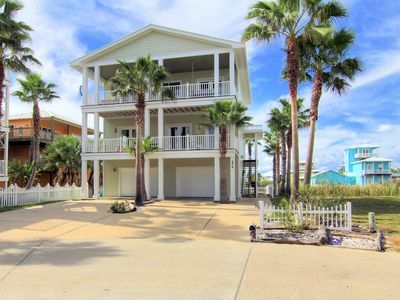 Fabulous beachfront home! 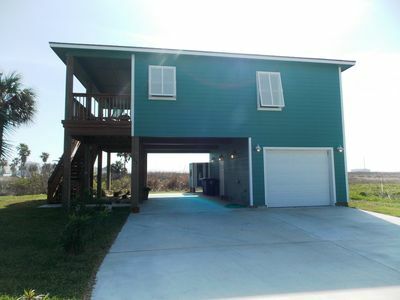 4 bedroom 3 bath home with ocean views! 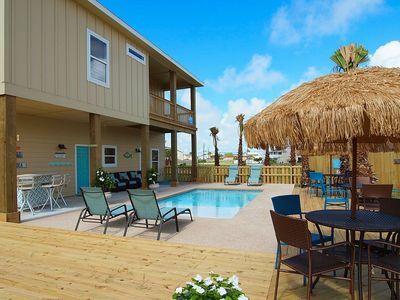 7 Palms - New 2 bedroom home in quiet location near Shlitterbahn Waterpark! 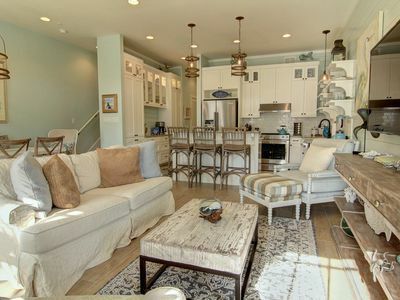 Relax in the shabby, chic Blue Heron!